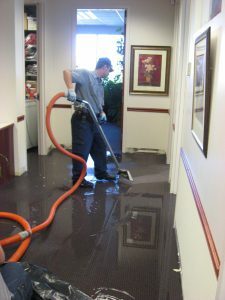 At Castle Cleaning we employ fully trained technicians in Flood Restoration. Having attended the intensive IICRC Water Damage Restoration Courses at the National Flood School our technicians are fully equipped to restore your property to its pre-flood condition, in the least amount of time possible. With every flood disaster prompt attendance is essential; the primary damage is what we call the initial part of the flood where the flood water migrates from one part of the house to the other. When at the property we will use various detection devices such as, moisture meters, Hygrometers, and equipment to perform calcium carbide testing. Our Flood Technicians are fully trained to test carpets, Floors, Walls and fitted surfaces i.e. kitchen cupboards. Given the volume of water and the level of contaminants, we will determine the correct amount of extraction and cleaning processes plus drying equipment required to restore your property to its original condition. After a flood occurs if the relative humidity is above 60% mould is already starting to germinate, so don’t delay, protect your property, belongings and health.